Summer is everyone’s favorite season – almost everyone’s. I prefer Fall. 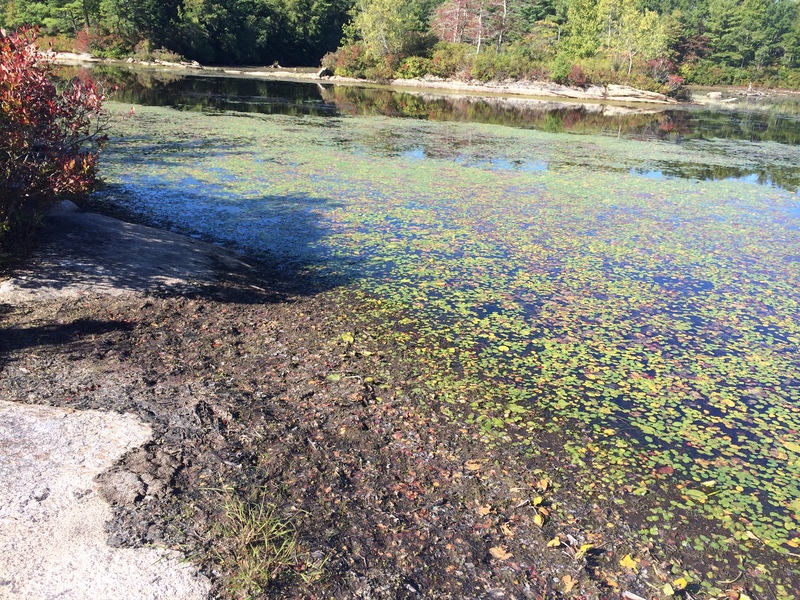 Here on the southern RI coast, the summer crowds are gone, the air is clean, you can hike without mosquitoes and deer flies harassing you, and you’re not in a sweat all the time. 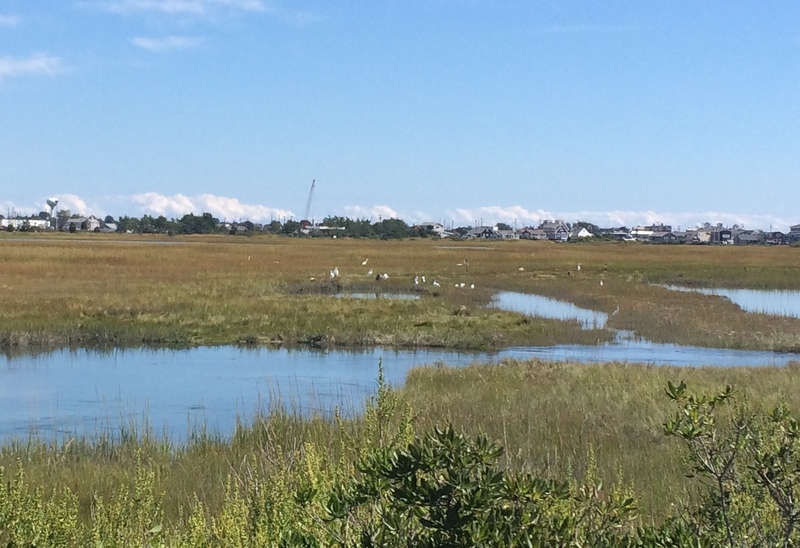 On the salt marsh, the egrets are “staging” or flocking together before they leave for the winter. There were a few great blue herons in this group, too. 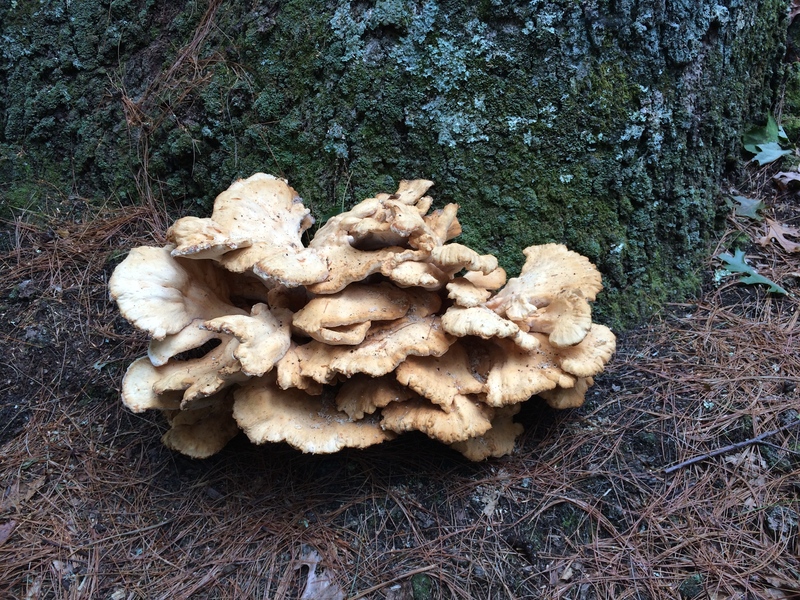 We saw this massive hen of the woods mushroom on a recent hike. It was at least a foot across. Fungi love Fall, too. The poke weed is ripening and birds everywhere are cheering. They can’t get enough of those juicy purple fruits. 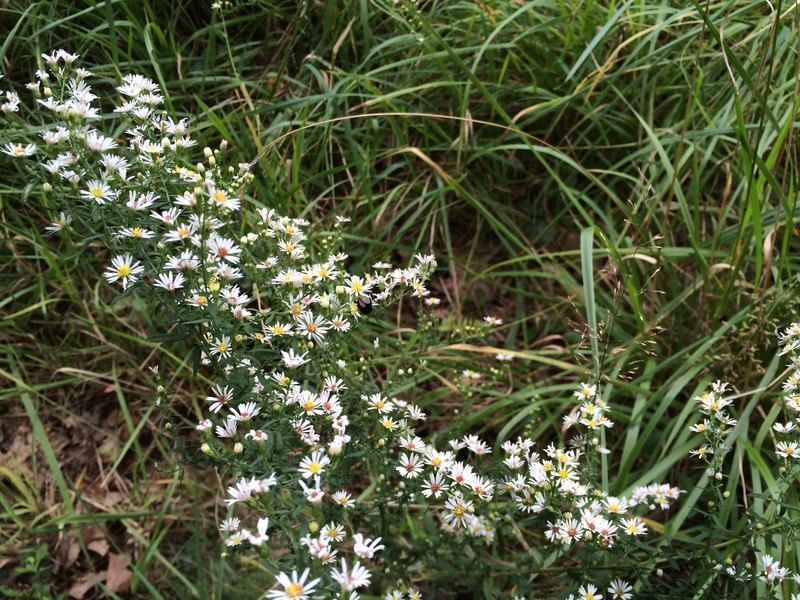 And those wild asters…..one more thing to love about the season. I’m with you, DN! My favorite month here is October, and one of the best things is the ability to walk the beach in peace. The only things to be heard are the waves and the seagulls. Wonderful! And the sound of construction in our neighborhood with out-of-staters either building new houses or adding to existing ones. YUCK!!!! saphire blue sky! And yes, love the off-season when the tourists are elsewhere. They have not all left yet, but soon…. Autumn is my favorite, too. The colors and the crisp days can’t be beat. The photos are fantastic, as always, dn. Thanks, CJ. Are you starting up your blog again????? I’ll post as the spirit moves me. I’m spending a lot of time working on my house now. And it will soon be time to get the garden ready for the winter months. Cool days bring big promises to do the heavy duty jobs. Happy to see you posting, whenever you feel like it! I love this time of year as long as it’s not cold and constantly raining. 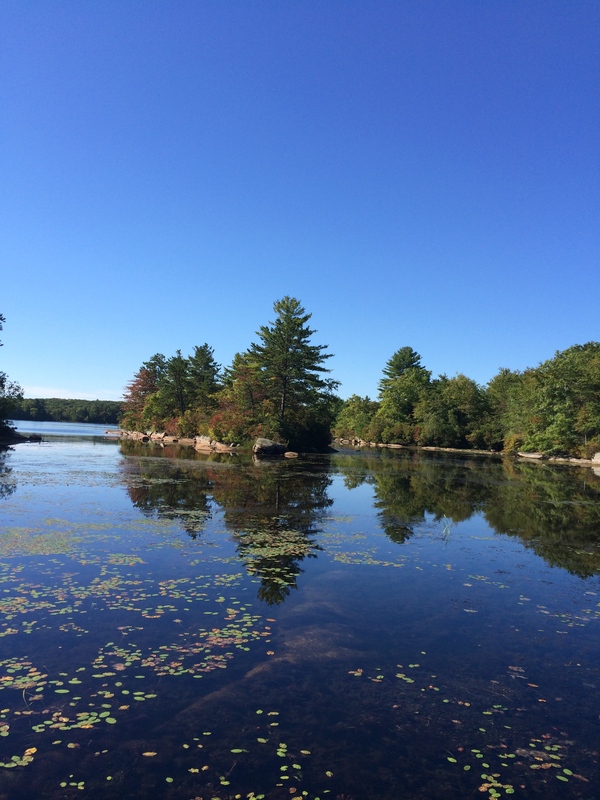 When the weather is nice, it is a spectacular season. I am so looking forward to all the autumn shades, which have begun in the northern areas not too far from here. I hope it’s a wonderful fall where you are. Enjoy your classic Canadian autumn, Martha. I do miss those. It doesn’t get “crisp” here until November. Summer, favorite season? No way. I’ll take fall, spring or winter. Anything but summer. 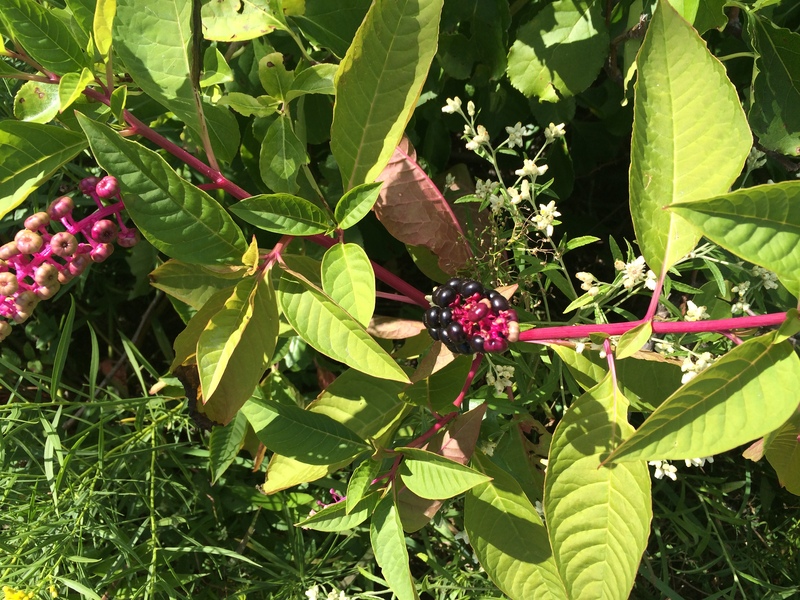 As for pokeweed, send those Northern birds down here, My poke berries are waiting. So nice to hear from you Lee. I do miss your blog, but I understand the pressure. Please drop me a line once in a while. As I write this, a huge flock of Canada geese is flying over our house, headed for the salt marsh. Love those natural rhythms of the seasons. Speaking of rhythms of the season, I noticed my turkey flock is heading back to the area surrounding my herb garden. It’s so nice to see and hear them again!